In the war room cabinet of a not-so-friendly neighbouring country, a kohl-lined, light-eyed, bearded gentleman (?) sardonically – in response to their dastardly operation which massacred Indian soldiers – says in Urdu, “What will they do? At the most they will ban our singers and artistes for some time; and everything will be back to normal soon.” This, more or less reflected the state of our response, till then. ‘Uri’, written by first-time feature director Aditya Dhar, is divided into five chapters – beginning with India’s troubled history of insurgency in North-East. The film then progresses to subsequent chapters, including the infamous guerrilla attack by four armed militants on the unsuspecting Indian soldiers in Uri, in Pakistan-occupied-Kashmir on 18 September, 2016. Vicky Kaushal plays Major Vihaan Shergill, a decorated army officer who sees his brother-in-law Capt. Karan Kashyap (Mohit Raina) perish in the dastardly attack. At the request of the Prime Minister, played by Rajit Kapur (a barely veiled reference to Narendra Modi), he abandons plans to leave active service to be by the side of his mother (Swaroop Sampat), who’s regressing with Alzheimer’s. It’s the concluding chapter with India’s retaliation on 29 September which destroyed the enemy’s four training camps housing mini-armies which makes up the bulk of the second half. As Govind Bhardwaj, Paresh Rawal essays the role of National Security Advisor Ajit Doval. Defence Minister Manohar Parikar, in his trademark half sleeves, is played by Yogesh Soman whereas minor actors, with a fair amount of resemblance to Rajnath Singh and Arun Jaitley, get to speak a sentence or two. Yamini Gautam is Pallavi, a backroom strategist, while Kirti Kulhari, as a fighter pilot, is little better than a glorified extra. 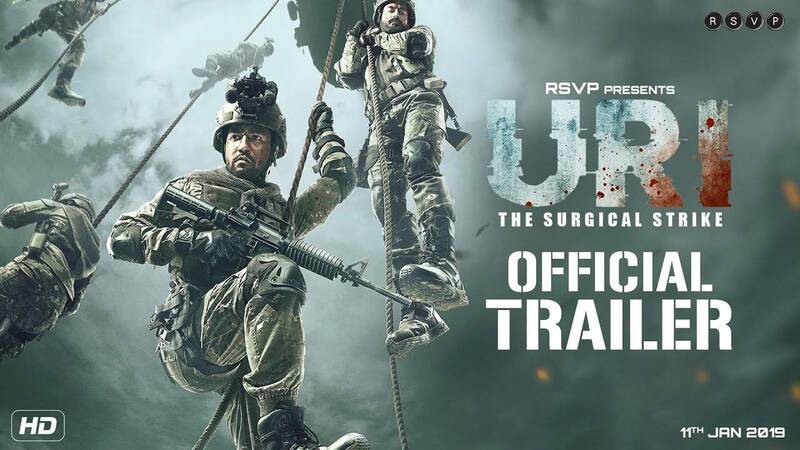 This is the year of quite a few films on patriotism and Uri begins 2019 by managing to whip up nationalist sentiments, thanks to the surgical executions and some well-choreographed action sequences. The film has competent editing by Shivkumar Panicker (Kapoor and Sons) and some admirable aerial cinematography by Mitesh Mirchandani (Neerja). Bishwadeep Chatterjee’s (Padmaavat) crisp sound design, with the rattling of machine-guns and jingoist exhorting by Shergill’s men, is one of the high spots of the film. This is not to say that the film is without blemish – the script could have been tightened a bit. The Garud drone episode seems to be overdone; also, would a battalion on a surgical strike be so reckless as to cause indiscriminate sounds while entering the enemy’s compound in the dead of the night?